Shoulder dislocations are common injuries in active athletes and individuals. These injuries are usually the result of a traumatic force, such as in during sport or from a fall onto the outstretched hand. The shoulder is a "ball and socket" joint. The "ball" is the head of the humerus (arm bone), and the "socket" is the glenoid (a part of the scapula). However, there are many additional ligaments and other soft tissue structures that help keep the shoulder stable in the joint. These include ligaments between the humerus and the glenoid as well as the labrum, which is a bumper that helps keep the shoulder stable. 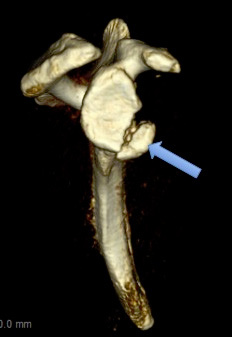 Most commonly, during a shoulder dislocation, the head of the humerus dislocates anterior, or in front of the socket. Posterior (behind) and inferior (below) dislocations are much less common. In a true dislocation event, the entire head of the humerus comes fully out of socket. Some patients may have "subluxation" events, which are partial dislocations. This guide will provide an overview of the injuries found in shoulder dislocations as well as how they can be treated. If you think you have an unstable shoulder or have had shoulder dislocations in the past, and would like to see Dr. Makhni for an evaluation, please call to set up a consultation. What gets injured when the shoulder dislocates? After a shoulder dislocation, there may be injury to the soft tissues or the bony structures of the shoulder joint. The most common type of injury is to the labrum and associated stabilizing ligaments. There is usually a stretching of the capsule (the soft tissue envelope around the shoulder) as well as a result of the injury. The cartilage is also often damaged during a shoulder dislocation event. Sometimes, there is also bony injury. There may be a bony injury to the socket (glenoid) or to the humeral head (ball) of the joint. If large enough, these require urgent attention. If you experience multiple dislocation or subluxation events, there may be continued damage to the soft tissue structures, bony structures, and cartilage. Arthroscopic views of the left shoulder in a young athlete with multiple shoulder dislocations. Note the labrum which is completely torn, consistent with the underlying injury. This was repaired arthroscopically by Dr. Makhni (see below). There are many different factors that must be considered when forming a treatment plan for an active individual or athlete with shoulder instability. If you have experienced a shoulder dislocation (or subluxation), we recommend you arrange a consultation with Dr. Makhni to have a detailed conversation reviewing the different treatment options. 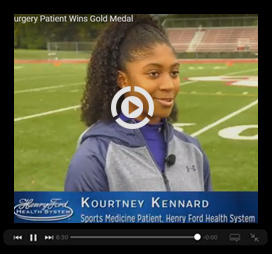 For athletes who have experienced their first dislocation, they may be able to return to sport within 4-6 weeks after a comprehensive rehabilitation program. Initial treatment may consist of a short period of immobilization in a sling followed by early return to motion and strengthening. There are occasions where surgical consultation may be required. This is especially relevant if the athlete or individual has experienced numerous shoulder instability events, or if the shoulder feels loose on a regular basis. There are also instances where early surgery may be required, depending on the injury mechanism, and this can be discussed in detail with Dr. Makhni. Dr. Makhni will also make sure to tailor the treatment plan according to the athlete's individual situation with regards to timing of injury and future plans for sport. Many patients who have experienced a shoulder dislocation or instability event can be successfully treated without any surgery. This treatment will consist of a short period of sling immobilization followed by an early physical therapy program. The goal of therapy will be to strengthen and stabilize the shoulder through focused exercises. For some athletes (especially contact and collision athletes), there may be specialized braces that allow return to sport while minimizing chance for recurrent instability events. Dr. Makhni can prescribe these braces in the office. Surgery may be required for some patients who have unstable shoulders. Patients who are likely to benefit from surgery include those individuals who have had multiple dislocations or instability events, or who have significant injury to the stabilizing structures of the shoulder. Often, these individuals may complain of "apprehension" or fear of using the shoulder because it is unstable. 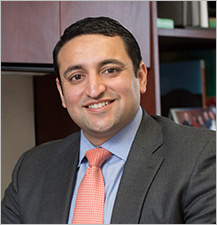 In those who require surgery, Dr. Makhni will work with the patient to devise an individualized treatment strategy. Most shoulder instability can be successfully treated with advanced, minimally invasive techniques. This is known as arthroscopic shoulder stabilization. Some patients who have significant bone loss or fracture may require an open surgery in order to restore the bone that holds the shoulder joint in place. 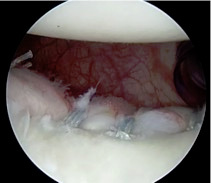 This is the same labral tear shown above but now with a repair using multiple sutures. Note how the labrum is now repaired down to the bone to allow for successful healing.